We’ve long known that Pinterest is one of the most favoured online image platforms that brides-to-be use in their wedding planning, but did you know that pinning weddings has risen to be a popular pastime brides-not-to-be as well? Latest figures from Pinterest show that there are a total of 38 million wedding boards on the platform, and of these, secret wedding boards (boards that are set to private and locked from the public eye) have grown two times from 15% to 30% of all boards created. The potential commercial spinoff for the wedding industry from Pinterest is a force to be reckoned with as well — a recent study by Millard Brown Digital revealed that 96% of Pinterest users were using the platform to plan for wedding purchases, and 87% made an actual purchase based on something they saw on Pinterest. For users who are not actually getting married, what is the attraction of pinning their dream wedding, even if they are nowhere near from realising it? Pepper Schwartz, sociology professor at the University of Washington, said, “It’s a kind of dreaming, a kind of fantasy. It’s like reading bride magazines, but it’s also like people reading Architectural Digest … I should say 99% of them cannot afford — even 99.5 of them cannot afford what they’re looking at. But they think about it.” Indeed, one can definitely “plan” their perfect wedding on Pinterest. With the right balance, Pinterest can definitely make the wedding planning process much easier, especially when you are trying to communicate what you want to your wedding planner and other vendors. While in the past brides had to spend more effort finding their references from extensive amounts of bridal magazines or search efforts, now, everything can be conveniently compiled into one Pinterest board. That saves a lot of time and effort to get you and your wedding planner on the same page. Did you use Pinterest to help you during your wedding planning process? 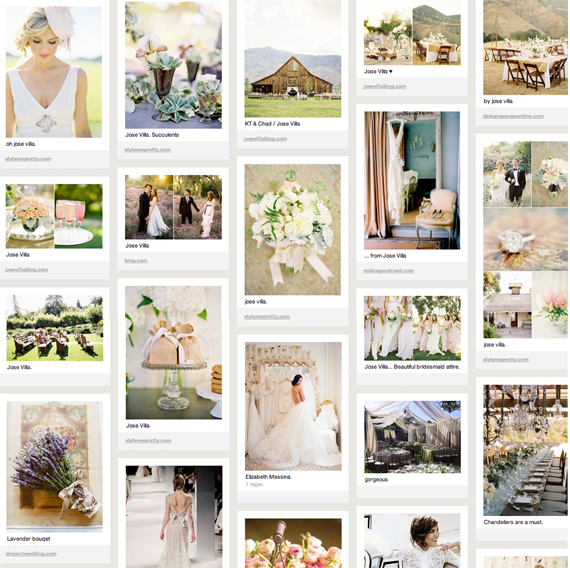 What do you think of ladies who start a wedding board even before they have found a partner? Share with us!